Have You Been Injured at Work and Have a Herniated Disc? There are many activities that can contribute to a herniated disc. Repetitive motions can cause stress on your low back or neck which may lead to a herniated disc. Other causes can include heavy strain, increased pressure to the lower back or neck, or even a twisting movement. All of these motions are common in a lot of different work environments. If you do any of these activities at your job on a daily basis you may be at risk for this type of injury. What is a herniated disc? The bones in your back are padded by small spongy discs. These discs are like shock absorbers for your spine and keep you flexible. If one of them becomes injured, it may swell or break open; this is called a herniated disc. You should go to your doctor if you think you might have a herniated disc. Most likely your doctor will examine you and ask about your symptoms. 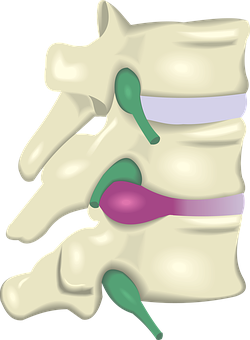 If necessary, he or she may request that you have an MRI or CT scan of the spine to verify that you have a herniated disc. There are a few ways a herniated disc can be treated. Your doctor may ask you to do at home exercises or see a physical therapist. If you go to a physical therapist they will help you to strengthen the muscles in your lower back and abdomen which help support your spine. You will most likely be working on flexibility of your spine and legs. Other treatment options include medications such as an anti-inflammatory pills or pain killers. If therapy or medication doesn’t help your symptoms, your doctor may suggest epidural injections or a discectomy. Receiving injections would help with the pain for a couple months; they tend to reduce swelling and help relieve your symptoms. If injections don’t help, then you may need surgery that would consist of removing the disc entirely. If you or a loved one have been injured at work our team at Walker, Billingsley & Bair is here to help answer any of your questions or concerns regarding any injuries you may have sustained and what workers' compensation benefits you may be eligible for. To receive a FREE book entitled "Iowa Workers' Compensation - An Insider's Guide to Work Injuries" which describes Iowa work injuries, including the "7 Mistakes To Avoid If You Are Hurt At Work" Call Now 1-800-707-2552 (ext. 511) (24 Hour Recorded Message) or log on to www.IowaWorkInjury.com. Why offer a Book at No Cost? Iowa workers' compensation attorney Corey J. L. Walker practices primarily in workers' compensation law and has represented hundreds of Iowans hurt at work and has seen too many clients from Des Moines, Newton, Cedar Rapids and throughout the state of Iowa make mistakes before they had the “right” information about work injuries, resulting in them losing thousands of dollars. Iowans hurt at work are beginning to realize that the insurance company is not there to help them and that they should have someone on their side. For immediate assistance, contact us online or call 515-440-2852 and ask for Corey.